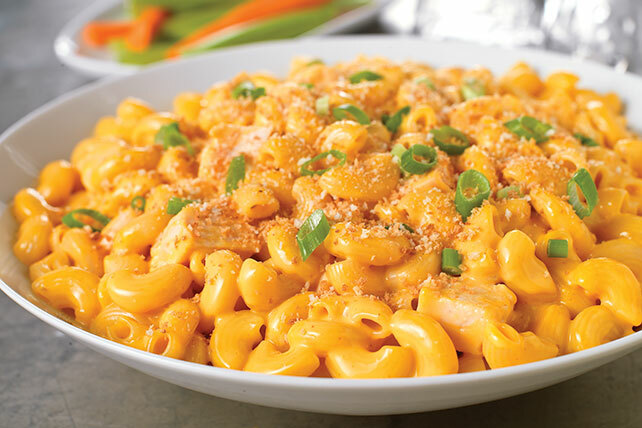 Spice up your weeknight with our Buffalo Chicken Mac and Cheese. Chopped chicken and hot pepper sauce gives this mac & cheese a hearty Buffalo-style twist. Prepare using KRAFT Deluxe Four Cheese Macaroni & Cheese Dinner. Substitute 1 pkg. (6 oz.) OSCAR MAYER CARVING BOARD Flame Grilled Chicken Breast Strips, chopped, for the chopped cooked chicken breasts. Or, use a rotisserie chicken from the supermarket.